Erin Webb, president of YourTownTV and Rick Clapp, owner and CEO of Bay Group Media, publishers of Bay Area Houston Magazine and Gulf Coast Mariner, announce their partnership to bring Bay Area Houston businesses the best in print advertising along with the option of full service web solutions for advertising and promotions. YourTownTV is a full service media company. 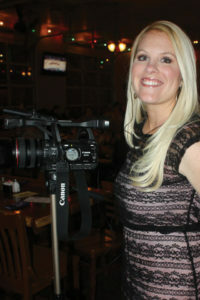 Owner Erin Webb has an extensive background in video production, web site design, marketing, public speaking and more. Her team consists of talented, hardworking individuals who are willing to do whatever it takes to ensure your project is delivered to you on time and to your satisfaction. YourTownTV uses state-of-the-art video production equipment and editing software to achieve the most professional look for your video needs. A five-star video production can be an excellent tool for selling any product, service or idea. Through the variety of services and experienced, creative staff, you’re certain to get an excellent video product. Erin Webb is a nationwide media expert, who has been connecting businesses, people and products for over a decade. With 15 years of experience in media, account management, sales, public speaking and networking, Webb provides professionals with the tools they need to increase clientele. Her multiple customer service awards for outstanding performance is a testament to her talents. She has cultivated partnerships with organizations such as TxDOT, Bayer, League City Regional Chamber, and Bay Area Houston CVB, to name a few. Webb leads a Young Professionals Committee and volunteers her time with several non-profit organizations. To schedule a free consultation regarding video options call Patty Kane at 281-204-9576 or email pattyhayes.kane@gmail.com.